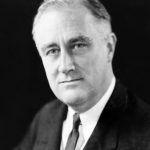 Franklin Delano Roosevelt commonly known as FDR, was an American statesman and political leader who served as the 32nd President of the United States from 1933 until his death in 1945. A Democrat, he won a record four presidential elections and emerged as a central figure in world events during the mid-20th century. Roosevelt directed the United States government during most of the Great Depression, implementing his New Deal domestic agenda in response to the worst economic crisis in U.S. history. "Put two or three men in positions of conflicting authority. This will force them to work at loggerheads, allowing you to be the ultimate arbiter." "If I went to work in a factory the first thing I’d do is join a union." "More than an end to war, we want an end to the beginning of all wars – yes, an end to this brutal, inhuman and thoroughly impractical method of settling the differences between governments." "If you treat people right they will treat you right… ninety percent of the time." "We are trying to construct a more inclusive society. We are going to make a country in which no one is left out." "Whoever seeks to set one religion against another seeks to destroy all religion."